We decided to use the Ubuntu operating system, assuming that we would not find any problem. As we do not have a computer with this operating system, we used Virtual Box, performing a basic installation of Ubuntu 12.04 version. While Configuring the system, we found a reference at Tizen Source, where it was indicated step by step how to install the downloaded image. We edited the repository to add the Tizen downloads web, installed the lthor tool and activated the phone in download mode. We connected the device with the USB cable and found that Virtual Box detected it. With lthor we ‘flashed’ the image to the device and ran it. It had been updated. 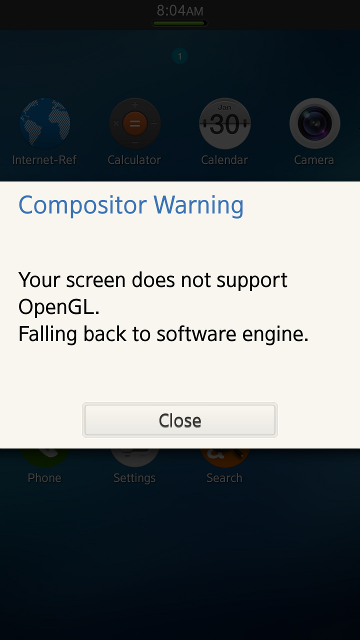 Once everything was in place, a message appeared on the screen: OpenGL not supported (see details of the message). Following the previous instructions, we needed the Tizen SDK for installing drivers, so we set aside Ubuntu and installed the Windows driver. In this direction is discussed where to find the if-needed-drivers. To verify that the device was correctly detected, we executed the instruction sdb_devices. We followed the instructions for updating the driver and once we restarted the device, the message no longer appeared. Operating System tested, correct version of Tizen installed and everything running smoothly. Can we already test a game compiled in Game Maker on my Tizen phone? And now, the moment of truth. We connected our device via USB, ran Game Maker Studio, chose our project and marked Tizen (Native) as output. We checked that our system had detected the device correctly by using the sdb get-state function on the tizen-sdk/tools folder. If the text ‘device’ appears, is has been detected. Otherwise, Game Maker will run the emulator, in which we are not interested. Finally, we ran the game and checked it properly appeared on the phone. Yay! We can also create an executable so that it is installed to test it thoroughly. We see that the resolution ratio is correct and the back button works fine (required if we want the application to be validated). So we can finish all the settings. If you want to configure Tizen to work with Game Maker, follow the directions given in the Tizen Knowledge Base. Do you think the configuration process has been hard?